Records of deaths reported in California are in various public records, which may supplement each other with, names of family, place and circumstances of death, physical description of the decedent, residence and their employment. Death certificates and obituaries are familiar to investigators and genealogists. 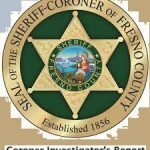 Lesser known public records are county Coroner reports of unexplained, suspicious or accidental deaths. These have narratives of the Coroner’s investigation, toxicology analysis and autopsy findings. Once the report is produced, it is available to anyone. Photos and video are released only with a court order. Provide the decedent’s name, and date of death if available. Alternatively, the Coroner keeps a log of all deaths reported to their office, the “Coroner’s Register.” This may give you a record of deaths by date. (a) The name and any aliases of the deceased, when known, including such description as may be sufficient for identification and which may, in his discretion, include fingerprint records. (b) A narrative summary of the circumstances leading to and surrounding the death, together with names and addresses of any witnesses to such events. (c) The property taken from the person or premises of the deceased by the coroner or by any other law enforcement agency or officer. (d) The disposition of any property or moneys so taken. (e) The cause of death, when known, with reference or direction to the detailed medical reports upon which decision as to cause of death has been based. (f) Information as to disposition of the remains. (g) Persons notified of the death, together with a notation of any unsuccessful attempts at notification. 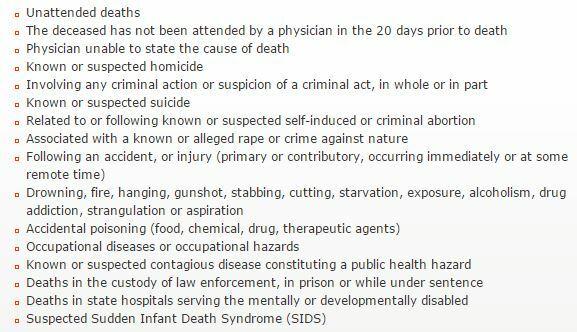 The Riverside County Coroner lists types of deaths that must be investigated. The San Diego Coroner adds that these deaths are also reported even though they are not specifically required by California law. Some California county Medical Examiners publish their Register online. The Los Angeles County Case Information is searchable by name or date of death. 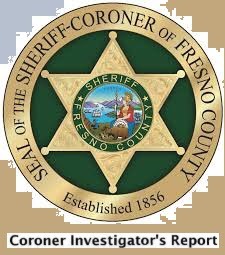 The Fresno County Coroner indexes reports issued 2013-2017. Or adjust the date in the url to retrieve all releases for that year, for example: http://www.riversidesheriff.org/coroner/Archive/indexMaster-2013.asp and http://www.riversidesheriff.org/coroner/Archive/indexMaster-2016.asp. Historical reports and proceedings of inquests are indexed at state or county archives and genealogical libraries. An inquest is a formal court hearing that is outside of the civil and criminal courts. It is also open to the public. These are conducted in cases involving deaths by law enforcement or whenever a law enforcement agency requests it. The Santa Clara County Archives, Coroner Inquests Collection consists of reports of Coroner inquests from 1891 to 1932. Searchable records at the San Bernardino County Historical Archives are mostly from the 1940’s through the 1950’s. Other states have similar sources. The Spokane County Medical Examiner’s coroner reports index displays the case number, name of the deceased and date of death of some historical records. Coroner reports can be ordered by phone or by letter. Cost is under $10.00 and are often available within a few days. This entry was posted in California, Public Records, Vital Records. Bookmark the permalink.